It was only last week when I reviewed the incredible Owlboy that I suggested the Nintendo Switch is fast becoming the home for the ever popular Metroidvania genre. Queue this week, and yours truly is back once more with another Metroidvania game for Nintendo’s hybrid masterpiece. This time though, it’s different. Where Owlboy was a colourful, retro-inspired, relatively short adventure, Hollow Knight is none of those things. 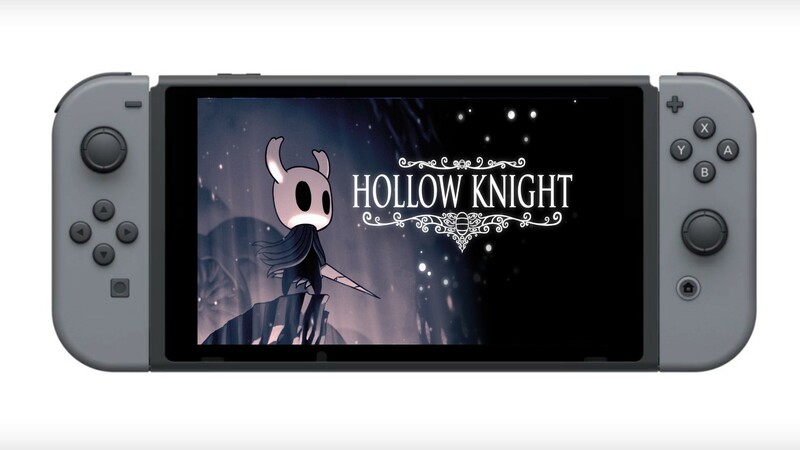 Hollow Knight is a game that has received admiration and acclaim since its release in early 2017, and as soon as the Switch was released, owners have been crying out for a port over to the Nintendo handheld. 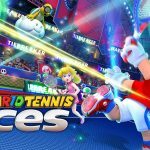 At E3 this year, Hollow Knight Nintendo showed an official announcement trailer, and it was actually made available on the eShop that very day! So, without further ado, let’s dive into the bleak world of Hollow Knight. That is a recurring theme here: bleak. At the start of Hollow Knight, you know nothing, less than nothing. Throughout your journey, you are never spoon-fed any details of the story, world, characters or anything. That doesn’t mean that there isn’t a story to be told here because there definitely is! You just won’t have any five-minute long cutscenes that tell you exactly what is going on. Think Dark Souls, and this won’t be the only comparison to FromSoftware’s magnum opus as this review continues. Starting off in Hollow Knight can be extremely daunting. You are literally only told that the once great land of Hallownest is a long-abandoned kingdom and that travellers have braved the depths of the ruins for knowledge and treasure, and many have gone mad in the process. The first area you’ll find after the short tutorial cavern is Dirtmouth, a town directly above Hallownest. After a brief conversation with an NPC, you traverse into Hallownest, and for a long time you’re on your own. Again, much like the story, the gameplay in Hollow Knight will not hold your hand and tell you where to go. When you first fall into Hallownest, there isn’t the slightest indication where to go! Just pick and direction and hope for the best. Players and fans of Souls games will love this freedom, though others might find it a bit intimidating, especially as the map in Hollow Knight is HUGE! The best way to traverse the map is to find Hallownest’s friendly cartographer. He will be somewhere within an area of the map, and he will sell you that area’s part of the map. He can be quite difficult to find as he isn’t always right at the start of an area, more hidden away within somewhere, but there is an audible clue of a pen scribbling and gentle humming which will lead you to him. Once you buy the first map from him, his wife’s shop also becomes available back in Dirtmouth where you can buy supplies, such as a compass that will show where you are on the map. You can also draw the map as you go if you purchase a quill from the shop, and every time you rest at a bench, the unexplored areas will be added to the blank map you have bought. This can be a better way of doing things, but some of the rooms/areas are cleverly hidden away, and you will often find yourself going back to buy the complete map anyway. While exploring Hallownest, you will encounter many, many enemies. Some are simple insects that won’t give you much trouble, some are slightly harder, some are tough, and some are just downright Souls-like hard. In the beginning, you’ll only have your trusty sword, or nail as it’s called, to fend off any foe you encounter. 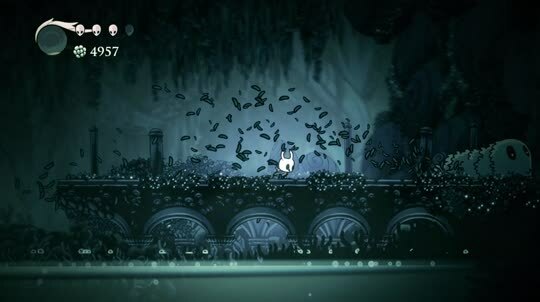 The only ‘skill’ Hollow Knight has at the start is the ability to jump. Most of the enemies you’ll encounter within the first couple of hours can be dealt with by these basic methods, but for those you cannot deal with right away, you will have to wait until you either upgrade your nail, learn new skills, such as dashing or wall jumping, or acquire some magic attacks, like a powerful blast which does come at a price. When you defeat an enemy, you’ll acquire their essence/soul. This is used to refill your own health meter. 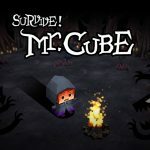 You’ll generally have a clue when a boss or particularly tough enemy is nearby as there will be a fair few easier enemies to kill to fill the soul meter up. Using the magic abilities depletes your build-up of souls, so you’ll have to be clever as to when to use the magic attacks. When you do succumb to death, which will happen to you a lot in Hollow Knight (and that might also put some players off), much like in the Souls games, you’ll have to travel back to the location where you died to retrieve all your dropped currency called Geo. A nice little niche here is that you have to fight your old spirit to get your loot back. 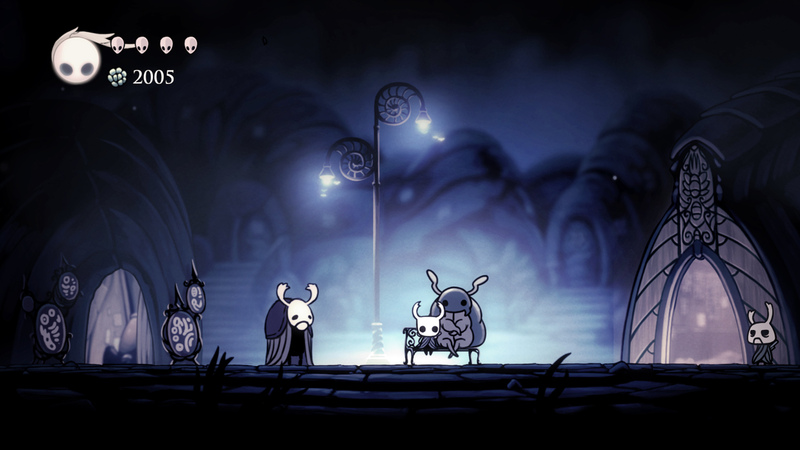 When you do fall in battle, you’ll find yourself on the last bench you rested, and these act like Hollow Knight’s version of bonfires. 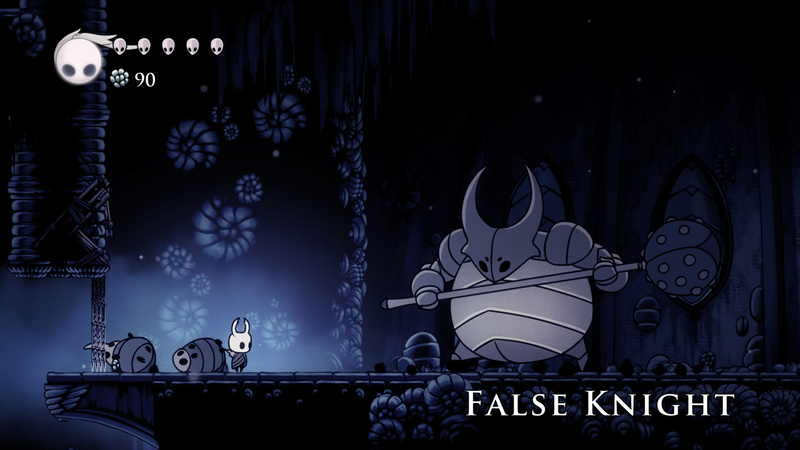 Combat is fun, challenging and smooth here in Hollow Knight. You can never once assume you are some all-powerful demi-god like Kratos as you’ll be humbled straightaway, like I was when I was killed by one of the most basic of enemies three times in a row because I had gotten cocky! Bosses will, of course, be the main challenge with regards to the combat, and there are a lot of them to kill in Hollow Knight. When you first come face to face with a boss, you’ll be tempted to charge and go all in with your sword/magic and unleash hell. If you go with that method? You’ll die in less than a minute. The bosses need to be studied, their attacks and movements learnt, and then you can unleash hell at the right time. The boss fights are more forgiving than those in the Souls games, but you can still be caught out if you get greedy and try to get a few more hits in before the boss attacks, which could lead to disaster. While the combat is a lot of fun, the best part of Hollow Knight is without a doubt the atmosphere. Hallownest is a decrepit, long forgotten ruin, but there are signs everywhere that it was once a beautiful kingdom. Exploring the depths of Harrownest in the state it is in now is harrowing. The once great masterpieces of architecture lay in ruins in the background, and the soundtrack is some of the most simple yet effective pieces of music I have ever heard while playing a video game. With Hollow Knight being a Metroidvania game, there will be a lot of backtracking here, either from not being powerful enough to defeat a certain enemy guarding a door or from learning new abilities to allow you to get to somewhere just out of reach. This backtracking, along with the size of the world, is the reason why Hollow Knight is a bit on the long side (around 32 hours or so), which is another aspect that could either keep people away from the game entirely or have them give up way before the end. I will just say that the backtracking can be a chore, but when the world itself is as brilliant as it is, it really isn’t a chore for very long, and with it now being on the Switch, the pick and up and play aspect is there to help if it all becomes a bit mundane. The port of Hollow Knight is perfect, and it looks equally gorgeous on a TV as it does on the Switch’s brilliant screen. The only slight, and I mean slight, issue is while playing handheld, I highly recommend you play with headphones. The music is so good yet so subtle in Hollow Knight that you really can’t appreciate it with the Switch’s standard speakers. Apart from that, this is a perfect port of an unbelievable game that is a great addition to the Switch’s ever-increasing library of Metroidvania titles.